You can reserve your day of climbing by calling: (800) 777-2546 in advance to make arrangements. Click here for pricing information. Click here to make a deposit online. We meet at 9:00am at the West Trapps Parking Lot at Mohonk Preserve. Click here for directions. Our climbing day ends at 5:00pm. We are located 90 miles north from New York City. Exit 18 from I-87. Click here for directions. There is a daily bus service from NYC to New Paltz departing from Port Authority. Click here for bus schedule. Please print and fill out our registration form and liability waiver and bring it with you on your trip. There's great camping nearby. Click here for the detailed information. We don't climb or teach in the rain. In case of unfavorable weather conditions we may cancel or reschedule the trip. Click here for the detailed weather policy. Below you will find all necessary information for your rock climbing trip. We offer individual as well as group instruction. Our guide to client ratio for group instruction will never exceed 1:4. We do not match up strangers to form a class. Since friends are naturally more accepting and accommodating of each other, we have found that this format creates the best environment for maximum learning efficiency. We have tried to eliminate the problems and distractions associated with mismatches in personality and ability. We meet at 9:00am at the West Trapps Parking Lot at Mohonk Preserve. 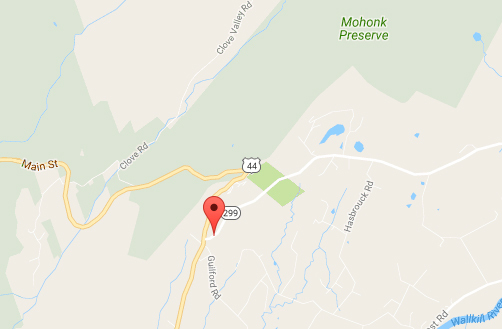 Mohonk Preserve is located 90 miles North from New York City (map and directions below). We will wait for you by our silver van in the middle of the parking lot. We'll gear you up there and will walk to one of the climbing areas. Click on the map below to be redirected to google maps, or follow the directions below. Our climbing day ends at 5:00pm. Take 299 through town and follow it up into the hills. About 7 1/2 miles from the Thruway Exit, the road ends at a "T" intersection. Turn RIGHT onto Rtes. 44/55 W. Go steeply uphill for about 3/4 mile. You will come to a marked "5 MPH" Hairpin Curve. Continue about 1/2 mile until you come to a Scenic Overlook / Pullout / Parking Area on your LEFT. About 300 yards past the Overlook you will see a small Red Bridge Overpass above the highway. Drive under the Bridge and continue about 2/10 mile. 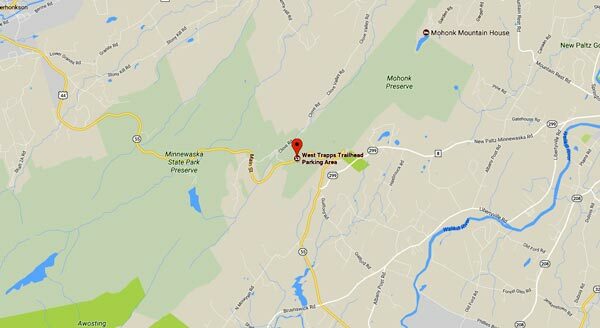 On the Right you will see a prominent sign "West Trapps Trailhead Parking." Make the RIGHT into a long narrow parking area and continue for about 100 yards. We'll meet you there! There is a bus service from New York City to New Paltz. Buses depart every hour - hour and a half from Port Authority Bus Terminal located on 8 ave between 40th and 41st streets. A ride to New Paltz takes 1 hour 30 minutes. If you are taking a bus, you want to get on 7 am bus. Follow this link for more details: www.trailwaysny.com. Bus schedule can be found here. Please print and fill out our registration form and liability waiver and bring it with you to avoid dealing with paperwork in the parking lot. The forms need to be filled out only once per season. We don't climb or teach in the rain. We have a simple policy that eliminates potential confusion about bad weather. Regardless of the forecast in your local area, call us early in the morning before you leave. We'll make the determination if climbing will be possible for that day. This way we can spare you the trouble of making the trip only to be rained out. If it's good weather here, we'll fully expect to see you at our meeting time. If you need to change your plans we'll accept cancellations up to 72 hours in advance of your appointment. Click here to check the local 5-day forecast. Click here for detailed cancellation policies. Clothing that's both functional and flexible is your key to a comfortable climbing day. Adjust your choices according to season. In cooler weather exercise-type tights have become popular. Loose-fitting pants or sweats are also appropriate. (Don't wear tight jeans!) For the upper body a few light layers, along with a wind-breaker shell or light jacket, will be fine. If it's cool enough, a ski-type hat and gloves might be a good idea. In hot summer weather, bicycle-type or walking shorts are appropriate. (Running shorts are not a good idea!) A T-shirt or tank-top is recommended. Many climbers wear no socks with their climbing shoes. If you'd prefer to wear socks make sure they're very thin! Wear sneakers or light trail shoes for walking around. Leave your heavy-duty hiking boots at home. Bring a light lunch and lots of water, at least 2 liters per person in hot weather. Insect repellent and sun screen are useful when conditions indicate. Put everything in a day pack or knapsack. You won't actually climb with the pack on your back, it's just the most convenient way to carry your things from place to place. We supply all climbing equipment: harness, climbing shoes, helmet and belay device. If you have your own gear, bring it along. Our guide-to-client ratio never exceeds 1:4. Our rates depend on the size of your party. Price includes a full day of climbing and climbing gear rental. A gratuity for your guide is not included in the prices listed below but is customary **. and are limited to children with little or no climbing experience. **Please note that there is an additional $20 park fee for non-Mohonk Preserve members. Please let us know when booking if you are a season pass holder. 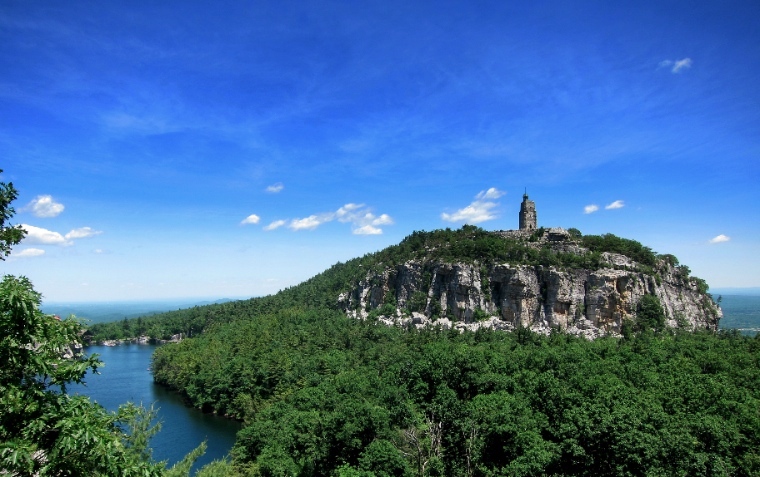 Click here for more information about Mohonk Preserve. Click here to make a trip deposit online.